The competition, judged by Mr Justice Edis, saw UCL Laws student Millie Rai declared the winner. 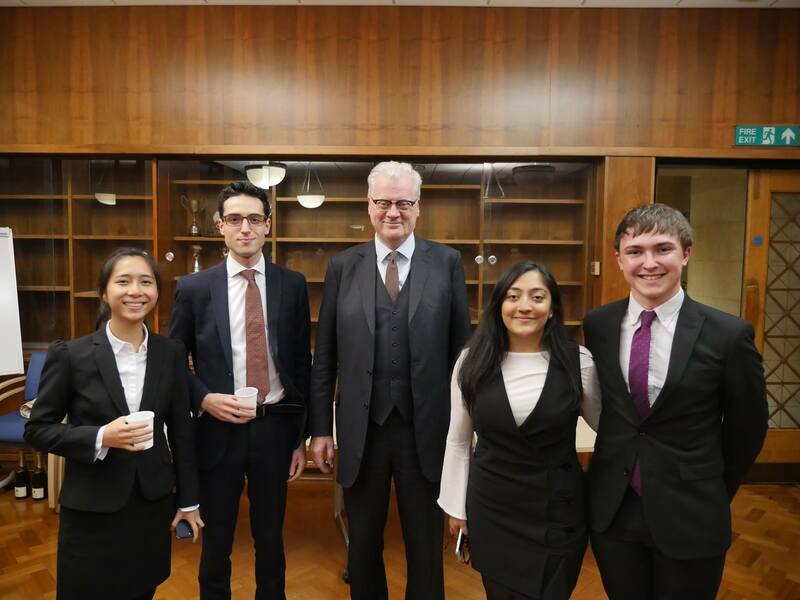 Earlier this month, four determined UCL Laws students battled it out to become the Herbert Smith Freehills Junior Mooting Competition winner for the year 2017-18. They had come far, having overcome six previous rounds and 106 other competitors. Held at the Moot Court in Bentham House on 4th October, second-year students Chris Moss (acting as Senior Appellant); Millie Rai (Junior Appellant); Alex Moja (acting as Senior Respondent); and Ellen Chan (Junior Respondent) presented their rigorous submissions before Mr Justice Edis, previously a top advocate in crime and now a judge of the High Court of England and Wales. With a vast legal career history including being the lead prosecutor in the infamous News of the World phone-hacking scandal case, and having defended in the Lady in the Lake murder case, UCL Laws was fortunate to have Mr Justice Edis judge the final – especially since it revolved around theft and the doctrine of joint-enterprise liability. The problem was written by Dr Mark Dsouza, Lecturer in Criminal Law at UCL Laws, and presented a legal challenge to all sides. By the end of the competition, only one point separated the winner and runner-up, and there were only two points between the winner and other finalists (who drew in points). Ultimately, the mooters fought hard, with Millie Rai going on to win the competition and Chris Moss finishing as runner-up.